← Was the Parchin explosion an Israeli air strike? One of the interesting things about the State of Israel is that it is suffused with people that hate it and want to destroy it. Some Jerusalem Arabs, for example, are doing their best to destroy the light rail system that services Jewish and Arab neighborhoods. Why? Because it serves Jewish and Arab neighborhoods. It represents coexistence or ‘normalization’. And these Arabs, who are permanent residents of Israel with all the benefits except the right to vote, could have full citizenship for the asking. But they are proving a Palestinian nationalist point by spurning it — and by attacking any manifestation of good relations between Arabs and Jews. “Hardakim” is a bastardized term for Haredim who join the army, coined from an acronym, Haredim kalei da’at, or “weak-minded Haredim.” It’s no coincidence that the term is strikingly close to the word “haydakim,” meaning bacteria or microbe – exactly the sorts of creepy crawlies that put cleanliness at stake. 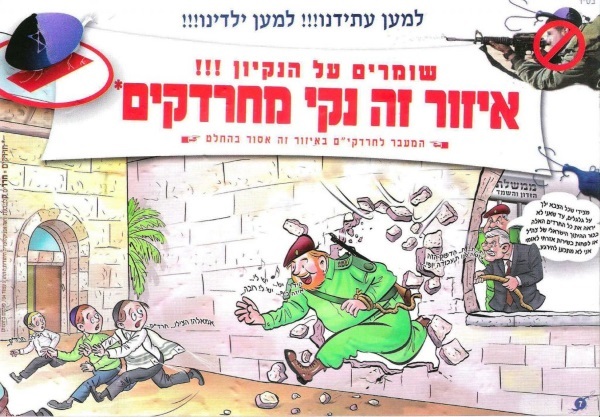 With long hooked noses and clownish bodies on the IDF soldiers, angelic postures for Haredi children and themes of contamination versus cleanliness, the posters bear a disquieting resemblance to the Nazi propaganda that was plastered across the streets of Berlin and Munich in the years before World War II, critics say. If this isn’t enough, we have the post-Zionist Left, the ones exemplified by Ha’aretz writer Gideon Levy and journalist Rogel Alpher. Their Oslo-syndrome guilt is so pathological that for them, Israel can do no right. Alpher urges enlightened Israelis to flee the country, and Levy grinds out the most vicious anti-Israel propaganda week after week. Finally, among the immigrants to Israel from the former Soviet Union, there are, incredibly, old-fashioned Jew-haters, including neo-Nazis. All of these anti-Zionists and Jew-haters benefit from the modern, developed, tolerant and democratic state of Israel in which they live, while at the same time they try to kill it. Israel is a country of 8 million, not 316 million like the US, and it faces a great challenge from the organized opposition to its existence from Iran and other Muslim nations, the UN, and various Jew-haters throughout the world. It doesn’t need internal enemies. My proposal is to resurrect the disreputable idea of a loyalty oath. Everyone — Jews, Arabs, other non-Jews — everyone living in and benefiting from this island of sanity in the crazy Middle East, should be asked to affirm their loyalty to the state if they want to live in it. They don’t have to agree not to criticize its policies, but they have to agree in principle to the idea that there ought to be a Jewish state, they will obey its laws, and that they will not try to subvert it. Every minority — and that includes Haredim — will have to understand that there is one state and its laws apply to everyone. There are alternatives for the anti-Zionists: there are 22 Arab countries plus the Palestinian authority for Arabs to choose from; there are Haredi communities in the US and Europe where they will not have to serve in an army or do national service; there are ‘enlightened’ European countries for such as Levy and Alpher. And of course the Russian Jew-haters can go back to Russia. The idea of a loyalty oath was very unpopular. It was called racist, anti-democratic, fascist, etc. I know the Arabs will cry bloody murder at such a proposal. They already have. But there is nothing racist about an oath for everyone. There is nothing undemocratic about agreeing to obey the laws that have been passed by a democratically elected Knesset. There is nothing fascist about accepting the idea of Jewish self-determination in our homeland. This entry was posted in Israeli Arabs, Israeli Politics, Jew Hatred, Post-Zionism. Bookmark the permalink. Putting all these haters together does not make a pretty picture. But I do not think a loyalty oath is the way to deal with them. Each has to be dealt with separately, but the principle should be that there should be a far greater sensitivity to certain kinds of treasonous action. The first example is the anti- Israel Parliament members who should be in prison for their actions. I believe another source of major anti- Israel activity is the newspaper ‘Haaretz’. If I had Adelson’s money I would have offered Schocken three times the amount it is worth and taken it over. ‘Haaretz’ has much done more damage to Israel than thousands of Haredim chanting slogans to themselves. I also however believe there should be harsher treatment for those Haredim who consort with Israel’s enemies, who for instance appear in Tehran. The list is long but I believe it is a question of the courts, the police, the legal system as a whole. And with all this the great danger for Israel is not from within, but from without. The whole Army of various jihadists, the regime in Tehran, etc. I think that a loyalty oath, similar in principle to that taken by US citizens, is a very good idea but, at the same time, each group of subversives should be dealt with separately. Haaretz should be singled out for special attention!